Former cyclist Andrew McQuaid has become Ireland’s first UCI-approved agent in professional cycling. 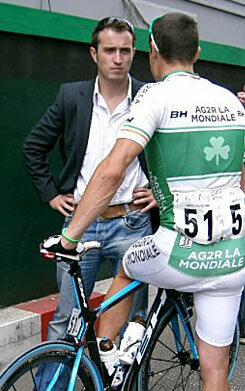 The Wicklow man was among the first batch of candidates to sit the UCI’s new agent exam. He has now learned that he passed the exam and as a result has secured his licence to practice as an agent to professional cyclists. Until now, the activities of cycling agents have been largely unregulated. However, the UCI has sought to bring order to the sports representation area, as the number of agents working for pro riders has increased in recent years. In September the first batch of would-be agents sat the first ever UCI agent exams, with 38 passing and securing a UCI agents licence. Andrew McQuaid, who is the son of UCI president Pat McQuaid, was among that group. He has been representing pro riders for a number of years, with a stable that began with Irish riders Nicolas Roche and Philip Deignan. McQuaid has expanded his Trinity Sports Management group of late, and as well as the Irish riders on his books he is now also representing Australian Richie Porte, American Taylor Phinney, South African Daryl Impey, Christophe Le Mevel of France, Briton Jeremy Hunt and a number of others. From the beginning of next year anyone wishing to work as an agent for a rider from a UCI ProTeam or Pro Continental team needs an agents licence from their national federation. Only those who pass the UCI’s exam, and are therefore certified by the world governing body, will be eligible for a licence. The only people exempt are a rider’s lawyer or his or her relatives acting as their agent. The UCI first decided twelve months ago to press ahead with a formal system of agent registration. It said its aim is to “professionalise, standardise and better monitor (agent) activity”.